KBShimmer created a facebook group exclusive a long while ago and I've been looking forward to wearing it. Finally, the time came where I was able to choose a polish I've purchased to wear. It was totally worth the wait, in fact I wish I could have worn it sooner. The blurple jelly-ish base is packed with holo glitter and teal/green shifty shimmers. 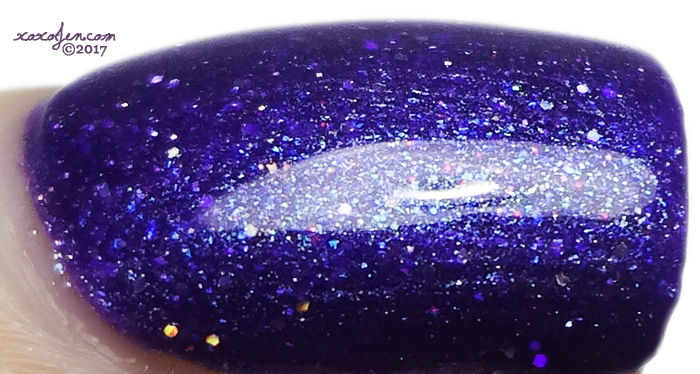 This polish is galaxy nails in a bottle! The formula was fantasstic as with all the KBShimmer polishes I've worn prior. I wore two coats with topcoat and it lasted almost a week without any chips! The polish is no longer available, I purchased it on June 6th last year. But you should join the facebook fan group if you haven't - maybe Christy will do another group polish at some point!